1. Complete our mandatory loan orientation. You can attend an orientation at our office located at 154 E Ford Ave Ste A, Salt Lake City, UT 84115 (view schedule here) or complete the online orientation. 2. Complete loan application checklist. All documents must be attached for application to be accepted. If you are approved for loan committee, Brandon will work with you to refine your business plan & cash flow statements and prepare you to present your business idea in front of the loan committee. You will present a 5-10 minute business pitch introducing yourself and explaining your business plan & cash flow statement. Our loan committees meet twice a month and they will decide if you will receive the loan. 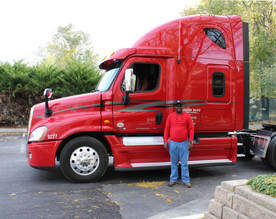 Our friend Thomas, a refugee from Nigeria, and his new truck purchased with a small business loan from the UMLF!